On Friday, May 26, 2017, Saint Theresa Catholic School conferred diplomas on its very first class of graduates. 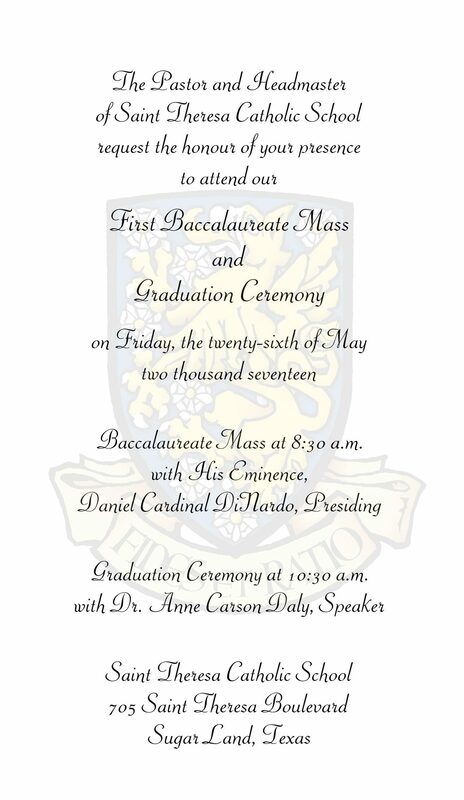 STCS families and students were delighted that His Eminence, Daniel Cardinal DiNardo, accepted our invitation to celebrate the Baccalaureate Mass, which immediately preceded the Graduation Ceremony. The 18 students of the first-ever graduating class of Saint Theresa Catholic School formed a very impressive group. All of them gained acceptance to their top-pick high school. These included such institutions as Strake Jesuit, St. Agnes Academy, St. Thomas, St. John XXIII, and Incarnate Word Academy. Most of our graduates have earned substantial advanced academic credit in Mathematics, Latin, and Spanish. 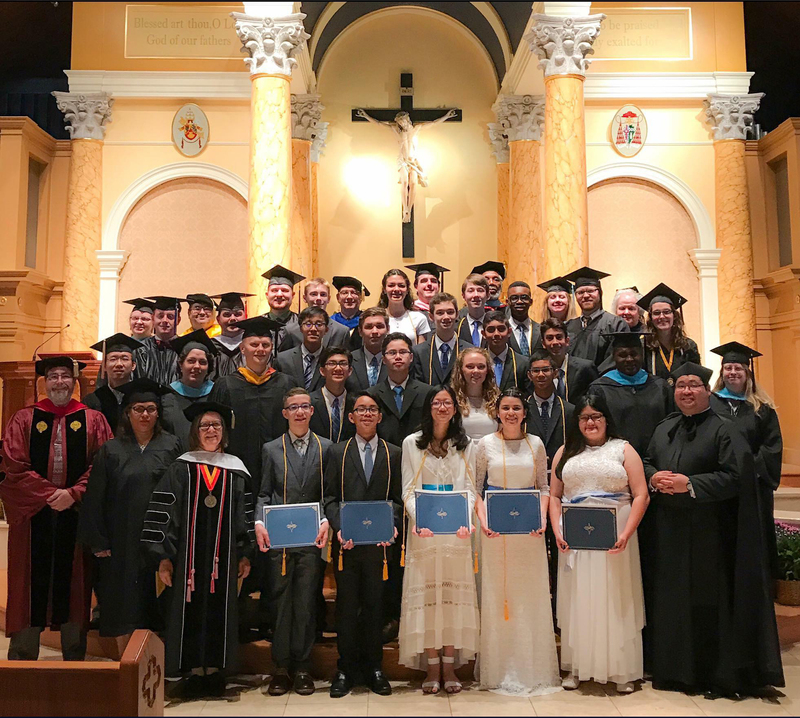 In his homily, Cardinal DiNardo congratulated the graduates on having had the benefit of a solid Classical and Catholic education, then charged the group to consider the good they could do for their fellow man in the world through the formation and training our students receive at STCS. He reminded the group that the use of reason and the development of character are unique gifts that God has bestowed upon man, and that each of is therefore called to use our gifts in service of one another. The faculty, processing in full regalia, took their places in the Sanctuary following Mass, and Father Eurel Manzano, Pastor, opened the Graduation Ceremony with a touching Invocation. Mrs. Francesca Rice, Assistant Principal, served with aplomb as Master of Ceremonies. Dr. Mark Newcomb, Headmaster, gave a brief opening address that reminded the graduates of how far they have come over the years since they first entered STCS. He also thanked those who laid the foundations—literally and figuratively—of our very fine Classical and Catholic institution. Dr. Anne Carson Daly, former Academic Dean of Belmont Abbey College and past President of Mount Saint Mary College, delivered the Commencement Address. She encouraged the graduates to face the future by orienting themselves to the light—Christ himself. She also challenged the entire assembly to think less in terms of self, and to focus more on those who need our encouragement and help. Dr. Daly noted that the path of wisdom lies in showing gratitude and lending a hand in support of the salutary labors of those around us. Mr. Chidubem Ezike took top honors as Valedictorian, and Mr. Dominic Corridore achieved the noble distinction of Salutatorian. The Ceremony featured a Gratitude rite, as each graduate presented a single rose—in honor of Saint Therese, the Little Flower—and a letter of thanks to their parents. In their notes, the graduates extolled their parents’ encouragement, financial support, and foresight. Individual graduates were then called to the stage to receive Achievement Awards for a host of academic distinctions in Music, Latin, Art, Spanish, Mathematics, Athletics and other subjects. The Morales family was given special recognition as the very first to register with STCS when the School was newly launched. The Ceremony concluded with a Benediction from Father Eurel Manzano, followed by a catered reception for graduates and their families in the Community Center.